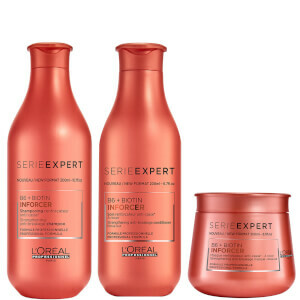 Restore life back into weak, fragile hair prone to split ends and breakage with the L'Oréal Professionnel Serie Expert Inforcer Shampoo and Conditioner Duo; a pair of complementary hair-care treatments that work in tandem to cleanse, hydrate and nourish for resilient locks with improved health, texture and luminosity. 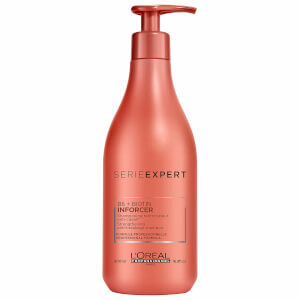 Specifically developed for thin, damaged hair in need of TLC, the conditioner helps improve manageability and replenish each follicle from within with a strengthening blend of Biotin and Vitamin B. 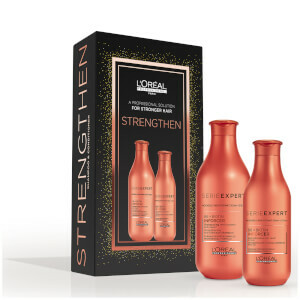 As a result, hair is left feeling more resilient and revitalised, with visibly reduced split ends and minimised breakage as well as mirror-like shine. Condicionador: aplique uniformemente no cabelo limpo. Enxague abundantemente. 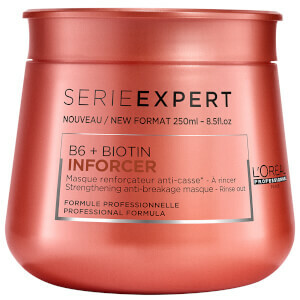 Conditioner: Aqua / Water, Cetearyl Alcohol, Glycerin, Cetyl Alcohol, Stearalkonium Chloride, Ceteareth-33, Octyldodecanol, Hydroxypropyl Guar, Amodimethicone, Alcohol, Sodium Pca, Pyridoxine Hcl, Limonene, Chlorhexidine Digluconate, Trideceth-6, Biotin, Benzyl Salicylate, Linalool, Citric Acid, Cetrimonium Chloride, Ci 15510 / Orange 4, Ci 17200 / Red 33, Parfum / Fragrance. C197678/1.